"Nice white bedspread. It's perfect for this hairball I've been saving." You recognize the sound instantly, it's unmistakeable. The familiar deep-throated hack of a soon-to-be regurgitated hairball. If Mr. Fluffernutters hacks regularly but produces no slimy lump of wet fur afterward, keep watch to make sure he doesn't need assistance removing that collection of hair from his stomach. Contrary to popular belief, cats don't cough up hairballs every single day. Some only do so rarely. Swallowed hair from your cat's regular grooming sessions usually pass through into his litter box with no problems. Some hair may stick around in the stomach, forming a tangled mass when more hair is swallowed. Your cat eventually hacks this hairball up. The frequency of this depends on how much hair stays in the stomach, whether your cat is shedding and how often he grooms himself. As long as he continues to eat and act like himself, you shouldn't worry if you haven't seen a hairball in a while. The sounds of imminent hairball appearance are hard to ignore. But if you hear this stomach-churning hacking frequently but find no hairball after, Mr. Fluffernutter may be having a bit of a hard time getting the thing out. You can help by offering him a hairball remedy, found at most retail and pet stores, which is a laxative and lubricant that essentially helps to move the hairball along through the intestines. Spreading a little petroleum jelly on his legs will spur him to lick it off and perform the same laxative function. Sometimes a hairball isn't just a nuisance, it can be dangerous. 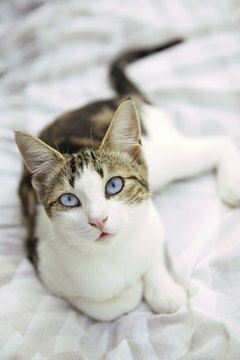 If the hairball in your cat's stomach grows too big, or slips into his intestines and becomes stuck, it can cause a life-threatening blockage. Behavior changes that accompany unproductive hacking can point to dangerous hairball obstructions, and require immediate professional help. If your cat seems suddenly lethargic and refuses to eat, and has been hairball hacking unsuccessfully recently, call your vet. He may have a blockage and require surgery to remove the stuck hairball. Unless you have a hairless cat breed, you're most likely going to have to deal with hairballs at some point. You can't completely stop them entirely, but you can reduce the frequency and danger by taking a few precautions. Brush your kitty regularly to reduce the amount of hair he swallows as he grooms, and offer him a hairball specialized food that helps whisk the buggers through his system. Offer him more toys and attention if he tends to over-groom when he's bored. Do Cats Get Irritable When They Can't Cough Up a Hairball?